Wow! What an awesome response to the hexagon giveaway! I never imagined so many people would stop by and to add me to their blog readers. I'm so excited! I can't wait to sit down and visit everyones' blogs! I'm hoping to get some sewing done this afternoon, but first I'll have to conquer this mess on my cutting table. I'm sure your table never looks like this, right? I've been sorting my hexagons by color, admiring some swap fabrics that arrived and thinking about making some more placemats. I sketched some placemat layouts yesterday at a really long red light and bought some Kona in coal that I'm anxious to cut into. Hopefully I'll have something pretty to show you soon. Have a lovely afternoon! Loving your little organiser - my 99 (yes, 99. how annoying!) hexagons are all stuffed into a tupperware at the moment, I need to find a better home for them before they breed much more. I'm glad you've had such a great response to the giveaway - you deserve it! It's an AWESOME prize!! 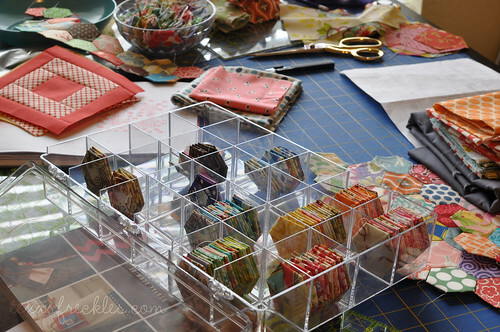 I love love love how you are keeping your hexagons organized - in that tackle-box-looking bin!